We are a company that combines the passion for races with the use of innovative technologies related to the processing of composite materials. Experience, professionalism and research are the key words that characterize our company. The technological innovation, the development of new production methods, the konw how aquired on the field and the craftsmanship of the product have made possible the growth of CMT compositi in automotive and design sectors. The best materials available in the world are used wisely by our technicians to produce top level special parts. Our products offer the ultimate in lightness and strength. Woven fabrics of carbon and Kevlar prepregs with epoxy resins are selected based on the purpose of the piece, to meet your aesthetic and structural needs. The fabrics for the construction of the pieces are cut using CNC plotter in order to achieve maximum accuracy and repeatability for each layer. 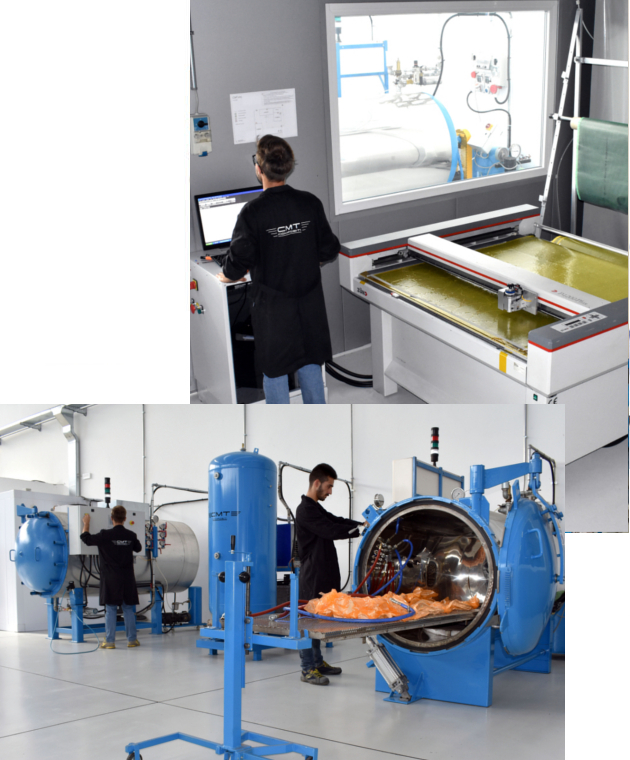 The laminating process is performed manually by highly skilled technicians, they optimize the orientation of fibers during the deposition of the layers into the mold to maximize the structural characteristics of the piece. Our manufacturing process provides the autoclave polymerization to reduce the percentage of resin within the piece and maximize the structural characteristics of the product. Less resin is equivalent to less weight and greater strength to mechanical stress. The ramps of temperature, pressure and depression are optimized for each type of resin, so we always get the best result. The hand finish ensure the perfection and the exclusivity of all our products. The characteristic shine of every piece is obtained by the absolute perfection of the molds used in production and by a complex process of polishing of the resin.